Melania Trump was seen laughing beside Vladimir Putin at a G20 dinner in Germany, hours after the Russian leader met her husband for the first time. 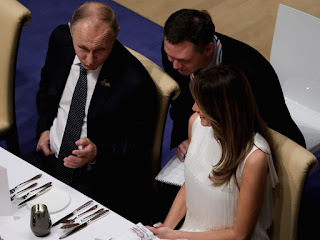 The first lady was seated next to Mr Putin at the official dinner at the Elbphilharmonie Concert Hall in Hamburg after she was sent in to end the meeting between the Kremlin leader and the US President when it overran. Mr Trump spent two and a half hours speaking with Mr Putin ahead of the dinner, in which couples were separated and not seated with their spouses. Ms Trump, who grew up in Slovenia, may have been seated next to the Russian leader due to her knowledge of several languages, including German which Mr. Putin also speaks. Secretary of State Rex Tillerson said Ms Trump was sent in to the meeting earlier in the day between the US and Russian leaders, which were meant to last just 30 minutes, to "see if she could get us out of there." But he said the meeting lasted another hour after the visit, joking that "clearly she failed." Allegations of Russian collusion in the 2016 US Presidential election have plagued Mr Trump since his inauguration. Mr Tillerson said the meeting was "very constructive", adding that "there was so much to talk about" that neither leader "wanted to stop." It comes after anti-globalization protesters stopped Ms Trump from joining the spouses of world leaders attending the summit. Ms Trump's spokeswoman, Stephanie Grisham, said last night Hamburg police hadn't cleared the first lady to leave the government guest house where she and Mr Trump spent the night because of the protesters.